Ribbon: Red with light blue and dark blue edges. 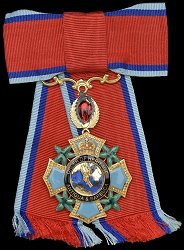 Awarded: For invaluable service to Antigua and Barbuda, the Caricom region or to the international community in any field of heritage and other cultural endeavours. Grades: 5 (Grand Cross, Grand Officer, Commander, Officer, and Member). 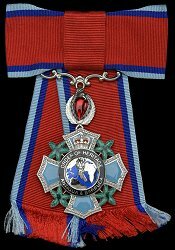 Post-nominal letters: Grand Cross - GCH, Grand Officer - GOH, Commander - CH, Officer - OH, Member - MH.